Samuel D. Chambers was born May 21, 1831, in Pickens County, Alabama. He was baptized at age 13 in Mississippi after hearing the preaching of Thomas Preston. The baptism was a secret because he was a slave at the time. 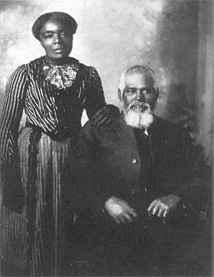 After the Civil War Samuel worked as a sharecropper and as a shoemaker. He moved to the Salt Lake Valley in 1870. in Salt Lake he acquired 20 acres of land which he planted with fruit trees and alfalfa. He was very successful in his farming business and had the general authorities of the Church as some of his customers. It is said that he was the largest tithe-payer in his ward for a long time. He even offered $1,000 to the ward building fund. At one point is is known that his fortune was worth over $60,000 which was a considerable sum of money. He gave much of his money away to various charities and benefits. Samuel died as an active member of the church in 1929 at the age of 91, not long after his wife had passed away. He and wife Amanda were lifelong loyal members. thank you for this piece ….